This apartment on the ground floor consists of 2 spacious rooms of 45m2 and 30m2 and a sunny (all day around) garden of 50m2. There is a separate kitchen, one bathroom has a bath, and another bathroom has a shower. 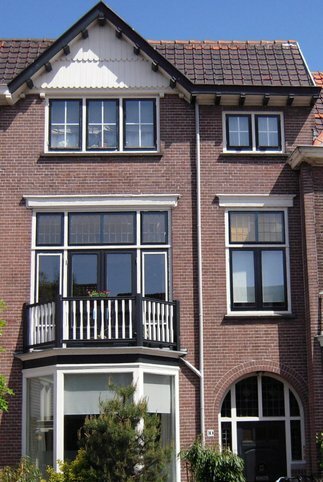 The house is close to the centre of Haarlem, at walking distance from the railway and bus station. The location is very suited for trips to Amsterdam as well as to the beach. A dune area with recreational lake is also close by. The house was built in 1911 and has high ceilings with stucco ornaments. Some windows are made of glass-in-lead. The living room has a fishgrate parquet floor. The recently built sleeping room has large stone tiles and double doors (French doors) to the garden. In the garden you find a wooden table and garden chairs.